The very successful orbital missions of the 1990's, Clementine and Lunar Prospector, provided key mineralogical, geochemical, and geophysical data sets that extended our view of the Moon beyond what we knew from Apollo and Luna exploration to a truly global perspective. These new data sets have been integrated with information gained from three preceding decades of study of lunar samples and older, less complete remotely sensed data sets. Although there have been no new lunar sample-return missions since Apollo and Luna, new samples are available in the form of meteorites, recognized to be pieces of the Moon. These, too, play a role in improved knowledge of the Moon and in helping to couple information obtained by remote sensing with information obtained from rock and soil samples. As we stand on the edge of a new era of lunar and planetary exploration, including new missions to the Moon, Mars, and other planets and moons, we find it essential to examine in depth how the wide variety of data sets obtained during the course of lunar exploration can be used together to better understand the formation of the Moon and how it evolved to its present state. Such an understanding holds important lessons for the new era of lunar exploration as well as the exploration of other planets in the Solar System. This will ultimately lead to better knowledge of how our own planet Earth - with its unique environment suitable for the origin and evolution of life - originated and changed with time. This book assesses the current state of knowledge of lunar geoscience, given the data sets provided by missions of the 1990's, and lists remaining key questions as well as new ones for future exploration to address. It documents how a planet or moon other than the world on which we live can be studied and understood in light of integrated suites of specific kinds of information. The Moon is the only body other than Earth for which we have material samples of known geologic context for study. 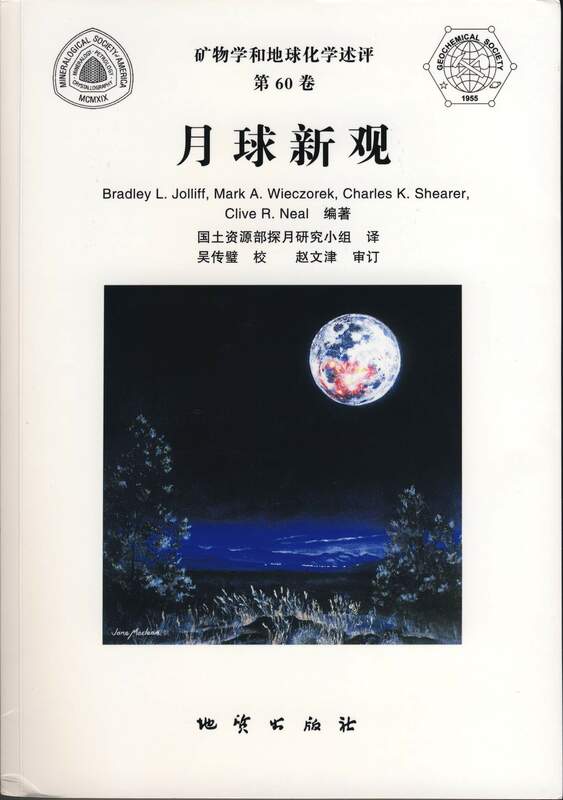 This book seeks to show how the different kinds of information gained about the Moon relate to each other and also to learn from this experience, thus allowing more efficient planning for the exploration of other worlds. Supporting Data Tables for Chapter 3, page 343, each with a link to a down-loadable MicroSoft Excel file. Table A3.1. FAS (ferroan anorthositic rock) compositions. Table A3.3. Alkali-suite compositions: alkali anorthosite/norite. Table A3.4. Alkali-suite compositions: granite/felsite & QMD/monzogabbro. Table A3.5. KREEP basalt compositions. Table A3.6. Impact-melt rocks & breccia compositions. Table A3.7. Granulitic breccia compositions. Table A3.8. Feldspathic fragmental breccia compositions. Table A3.9. Lunar meteorite compositions. Table A3.10. Remote sensing identifications of arthorthosite. Table A3.11. Mare basalt group compositions. Table A3.12. Volcanic glass group compositions. 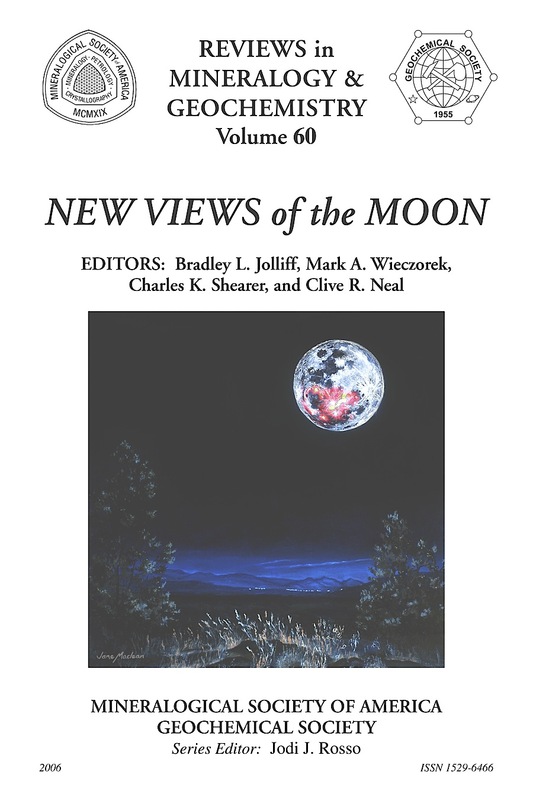 Lunar Gravity, Topography and Crustal Thickness Archive of Chapter 3 of New Views of the Moon. Description and introduction to the Lunar Gravity, Topography and Crustal Thickness Archive as a pdf file. 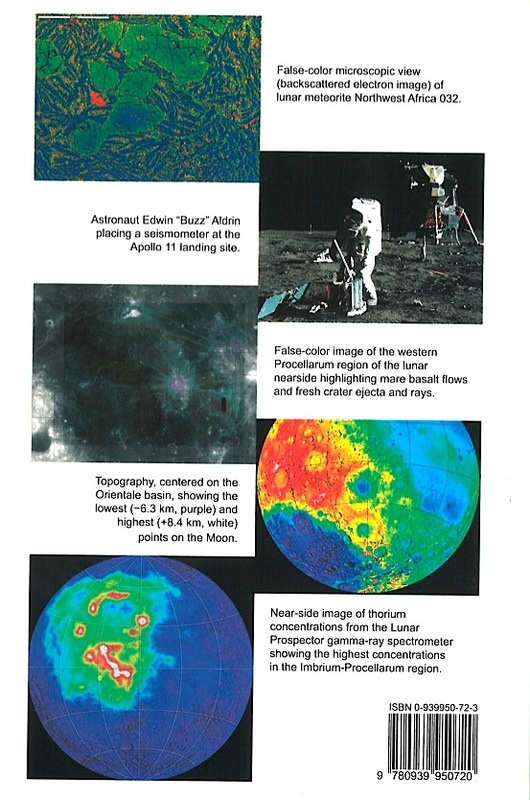 Color Plates of New Views of the Moon, each with a link to a down-loadable, electronic high-resolution version.